A TALENTED rugby league player from South Elmsall has revealed his pride at representing Ireland internationally after suffering two years on the sidelines through injury. Joe Mulhern, 21, pulled on the famous green jersey for the Emerald Isle for the first time in their Four Nations warm-up game against Wales in Neath. The former Upton RLFC junior had represented Ireland Students but admitted he “wasn’t expecting” a call-up for the senior side so soon after recovering from a troubling hamstring injury. Mulhern, who qualifies for Ireland through his dad, who was born there, only got the call to play in the international on the morning of the match and raced down to The Gnoll with ‘giddy’ family members. Wales ran out 30-6 winners in a scoreline that flattered the hosts, but it didn’t spoil Mulhern’s debut. “I wasn’t expecting to be picked after being injured for so long, it was a bit of a surprise,” he said. “I’d played for the student team and also Ireland A but I didn’t think I’d play for the first team so soon. The centre, who had trials with Featherstone Rovers in the summer and has been part of the Castleford Tigers Academy set-up, plays for Leeds Met University and caught the eye of the Ireland Students coaches in 2007. He could have waited for a chance with England but insists Ireland was his first choice from an early age. He represented Ireland Students at their Four Nations tournament in the summer, earning the man of the tournament for his country. It meant a call-up for Ireland A and he was in-line to play in games against England and Scotland in the summer. 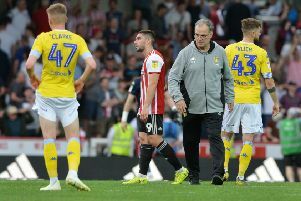 But another niggling injury ruled him out of the game against Scotland and his chances of playing for the first team looked slim before he impressed in a 60-minute outing for Leeds Met in their first game of the season against Newcastle. It prompted Tim Rumford, his coach at Leeds, to recommend he be picked for Ireland. “I still wasn’t 100 per cent match fit for the game but I just couldn’t turn the chance down,” said Mulhern. “I got a good run-out, about 30 minutes, and it whet the appetite to play more, it was a great experience. Mulhern has been included in the Ireland squad to take on France at Thomond Park in Ireland on Saturday (kick-off 5pm). See this week’s Hemsworth and South Elmsall Express for all the latest sports news from around the area.